Termites are a common problem in the Pennsylvania tri-state area, perhaps even more so than many other states across the country. Many of the homes here are older, and the rain and moist environment causes the wood of these homes to become delicacies for termites. Termites cause billions of dollars in home damage every year and a great deal of that is on the East Coast. 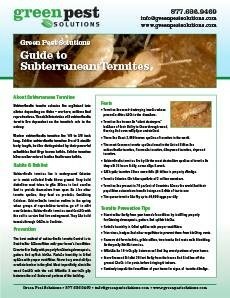 If you already have termites and need termite control services, contact Green Pest Solutions today at 877-636-9469. But treatment is not as effect as prevention, which is why it’s important that you also take the necessary steps to prevent termite infestations. Move Firewood Away – The most important strategy for preventing termites is to move any wet wood away from the home. An example is firewood. Firewood should be as far away from the home as possible, as it is the most popular food for termites and will attract them to your home. Consider Moisture Control – Inside of your home, you need to control your moisture, especially in areas that retain moisture and have wood the termites might enjoy. Consider a dehumidifier in attics, basements, and garages if those areas have excess moisture. Trim/Remove/Monitor Old Trees – Much like with firewood, termites will look for the most delicious meals first before moving on to your home. If you have an old tree, make sure it’s trimmed or removed. If you don’t want to remove it, watch it closely for signs of termites. Keep Space Between Plants, Water, and Home – It’s also recommended that you keep all plants and water as far from the home as possible. Make sure your gutters and drains are working and consider non-edible landscaping around your home. Check for Signs – Before termites become a serious problem, they leave trails. For example, pay attention to discarded wings. Wings found on the ground can mean that termites are looking for places to start a new nest. Also, pay attention to your neighbor’s homes as well. If they have termites, you are more at risk. Termites may not be the scariest of pests, because they do not carry disease, bite, or otherwise look gross. But they are perhaps one of the worst, because while a spider’s bite may not kill and a bee’s nest can be easily removed, the damage you receive from termites can be permanent and cost you thousands. The best way to protect your home from termites is with prevention, using the tips above. But if you also have termite problems, contact Green Pest Solutions today at 877-636-9469 and make sure that you’re able to remove the termites as quickly as possible.